Outsmarting Depression is a rather odd book, collecting together information about different psychological causes of depression and criticisms of psychiatry and its use of medication. 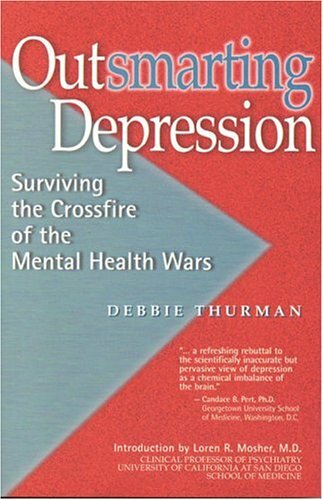 Debbie Thurman includes discussion of her own experience of depression and stories of people she knows who have also gone through depression. This includes their own diary entries and poetry. For me, the most interesting part of the book were the last two chapters, written by health care professionals from a number of different viewpoints: they are a psychiatrist, a general practitioner, a psychologist, a clergyman, an orthomolecular physician, a homeopathic physician and a holistic chiropractor. Thurman has written or co-written 7 books in the last five years, including From Depression to Wholeness: The Anatomy of Healing (Cedar House, 2000) and Sheer Faith: A Teen's Journey to Godly Growth (Cedar House, 2003). Her expertise comes from her own reading of books, journals, the Internet, and newspapers. She is especially influenced by Molecules of Emotion: The Science Behind Mind-Body Medicine (Simon & Schuster, 1997), by Candace Pert. Pert, a researcher at Georgetown University School of Medicine, returns the compliment by providing a blurb on the back of the book. The book also has a blurb from Loren Mosher, whose work on treating schizophrenics with minimal or no medication is described in the book. Mosher's work suggested that medication was not as effective as psychosocial treatments, but nevertheless he had to finish this research project in 1983 because he could not get funding. Pert also includes Mosher's resignation letter from the American Psychiatric Association from 1998, in which he complains that "psychiatry has been almost completely bought out by the drug companies." The somewhat rambling book covers the problems of psychiatry, childhood trauma, psychiatric survivors, the role of faith in recovery, and alternative therapies. Thurman is especially enthusiastic about "orthomolecular medicine," which seems to be largely based on Biochemical Individuality by Roger Williams (McGraw-Hill, 1998). It focuses on the connection between emotions and bodily health, diet, wellness and ecology. The book has a good index and includes appendices with self-evaluations questionnaires, ten tips for conquering depression and a journaling exercise. It is competently written and some people might find it interesting or a useful resource. However, most readers will probably find it more useful to go straight to the sources that Thurman uses, since she has done no original research of her own.